Every day I seem to be learning something new about our place in the sun. Walking through the tunnels of my mind, I am reminded of times when life was not as good. I am also reminded of those who have walked before me and along side of me, and some of those memories are tender to my heart. God has provided a masterpiece in my now life, and today I am very thankful for the paths we have taken. Life is good at Para-Deys Acres and it is my vision that the best is yet to be. This morning I counted the morning glories on the vine in the garden. There were only three, but their beauty was beyond compare. 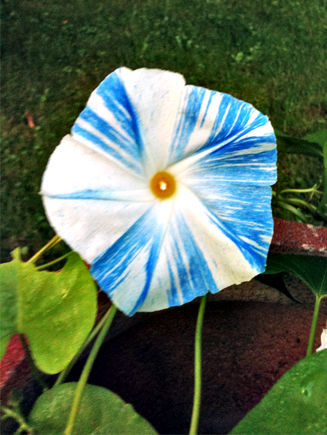 One was white with just a touch of blue. Another white with symmetrical stripes all around. The third was heavenly blue, and they reminded me of my family tree. Mother and Dad had dark, wavy hair - my brother Dave - the same. Eight years later we came along - a boy with a soft mahogany crown, and me with the strawberry blonde fuzz. Needless to say, not only did my parents have twins - they were also redheads. I don't think that my mother ever got over the shock! How closely we resemble the gardens of our choice. 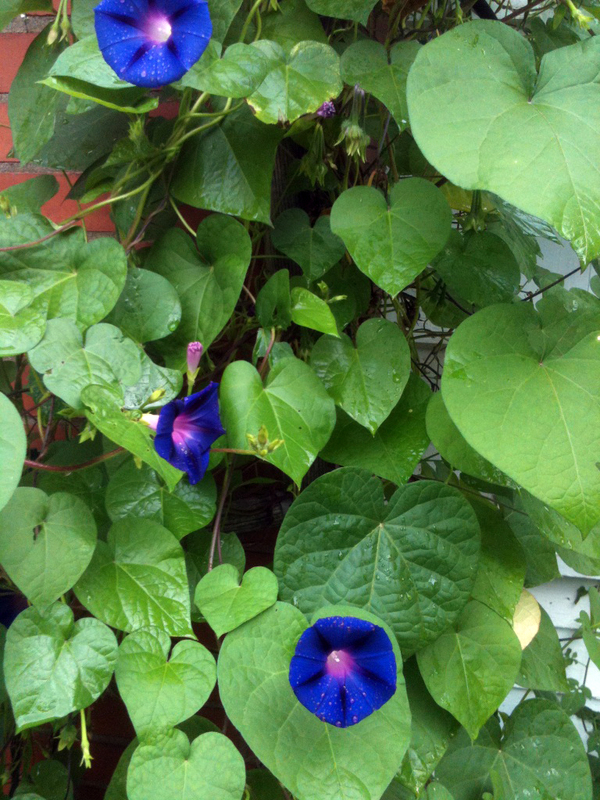 Like an expectant parent, I have been watching those morning glory vines every day. Two days ago I was adjusting the vines from one of our more recent vigorous windstorms, and there she was - the first blue and white blossom. Not knowing what to expect, I was like a kid on Christmas morning. Although many are not inclined top "smell the roses" along the highway of life, it seems to me that they are missing out on some of the really good stuff surrounding us every day. We came home from a day trip to Fair Haven today where we had journeyed for lunch at the old Hardware Cafe. What a fun place, and so interesting. The chicken salad sandwich was delicious, and I saved room for some cookies down the street. We had read about a cookie store around the corner from the cafe in The Finger Lakes Times, so decided to check it out. The owner had taken a little nook in a row of cottages, and transformed it to a place of deliciousness and interesting things. One wall was filled with a miniature display, softly lit with strategically placed lights. The middle of the room held dozens of old-fashioned glass containers filled with all kinds of homemade cookies--real butter, fresh eggs and all of the wonderful ingredients which make for absolutely delicious aroma. Of course, we filled a bag with at least a dozen and munched on them on the way home. The store is called The Fly by Night Cookie Company & Miniature Museum. Last but not least, the owner had a porch with table and chairs, and hand-carved posts all around. They reminded me of totem poles, so intricately done that they were amazing to see. On the way out we noticed a little sign re: a book nook in the back, and passed through a small gate to then climb an uphill brick-laden pathway to a tiny little house filled with many, many wonderful books. An interesting garden and pond surrounded all of this, and I could have spent hours looking around. Inspiration seems to come from many places when one takes the time to open their eyes to the wonders that God has provided. Each in our own way we translate our talents to the every day world, and if we are lucky--and present in the midst of potential--others may also be blessed by this grace. I cannot remember a time when I did not comprehend this. Today I am thankful that I still can, despite all of the hardships and horrendous weather and wars that have touched so many. It is my prayer that somehow, some where they will also find justice in their lives and that somewhere, some place they will have their own sanctuary to guide them. It is the inner world becoming the outer which makes it so important to keep the paths clear of the rubble of past discernment. Counting the morning glories, celebrating their beautiful colors, and listening for the blue jay with his raucous call every morning as he stops by on the deck for his share of the bread and birdseed we have provided for all who drop in along the way. I have seen three at once, and I do think that they are family. Tomorrow we will cook a chuck roast over a campfire in our Dutch oven. Purchased at Joe's Market over off 104, we know that it will be good. if you haven't tried it cooked this way, it will be well worth your time. Browned in oil, water added, cooked for a few hours, and then all kinds of fresh veggies added to it. By the time it is dinner time, you won't believe how hungry you have become and will probably draw a few more for dinner as the luscious fragrance floats on the breeze calling friends home to "Suppertime." A few sliced red tomatoes, dressed with mayo, cut up crispy cucumbers for salad, and freshly baked bread! Hey! What more could you ask? It is time for another celebration of the holidays, and it is our wish that only good will come for all who recognize this possibility in their lives. Yes, it is a long time "from May to September"--and the myriad colors have only just begun to shine, shine, shine. How silently the every day wonders could so easily disappear. Let us be diligent in keeping the flame of hope alive. Our words and actions do make a difference. 3 Comments to "HOMESPUN - Chapter Twelve"
That was wonderful carol,peace be with too!